Recent advances in radiation oncology have resulted in state-of-the-art treatment technologies such as stereotactic radiosurgery, stereotactic radiotherapy, and stereotactic body radiotherapy which commonly use small radiation beam apertures. Unlike reference field (10 cm×10 cm) dosimetry which has established dosimetry protocols,, small field dosimetry is challenging due to the breakdown of lateral electronic equilibrium, source occlusion, and choice of appropriate radiation detectors., The definition of small fields was very subjective, and recently, Charles et al. provided a meaningful definition of small fields using Monte Carlo simulations and concluded that <15 mm×15 mm field should be considered as very small field for 6 MV photon beams at 1% uncertainty level. However, if the uncertainty level is relaxed to 2%, then <12 mm×12 mm field should be considered as very small field. Furthermore, in realistic situations, this definition may vary depending on the selection of detector. Amorphous silicon electronic portal imaging device (aSi EPID) is a two-dimensional (2D) detector array attached to the linear accelerator (linac). Initially, it was developed as a verification tool for patient setup  but later, it emerged as a dosimetric verification tool also. Curtin-Savard and Podgorsak  and Pasma et al. studied the dosimetric properties of EPID for pretreatment dosimetric verification of intensity-modulated radiation therapy (IMRT). Later, various authors also studied EPID response for pretreatment IMRT quality assurance (QA),,,, transit dosimetry, and routine linac QA,,,,, but EPID has not been investigated thoroughly for small field dosimetry. The main advantage of using EPID for small field dosimetry is that being a 2D detector, it eliminates the placement uncertainty, and secondly, it is commonly available with new machines. Therefore, the purpose of this work is to investigate the EPID for output factor and profile measurements for 6 and 15 MV small field photon beams. All the measurements were carried out on a medical linear accelerator (CL2100 CD, Varian Medical Systems, Palo Alto, CA, USA). The linac has dual photon beam energies (6 and 15 MV) and six electron energies with a maximum deliverable dose rate of 600 MU/min. 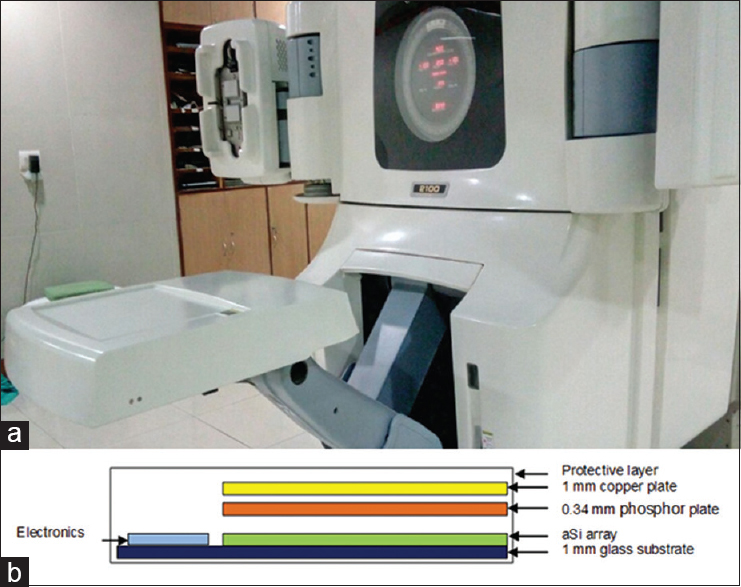 The linac is equipped with amorphous silicon flat panel aSi EPID mounted on a robotic arm (Exact-arm, aSi 500 II portal imager) as shown in [Figure 1]a. The EPID system includes image detection unit IDU-20 with image acquisition system IAS3. The active area of the EPID system is 40 cm×30 cm at the isocenter with a pixel matrix of 512×384 providing a resolution of 0.781 mm. The 2D detector is encompassed inside a plastic cover and has four major 2D layers inside it as shown in [Figure 1]b. First one is a copper plate of 1 mm thickness which provides an intrinsic buildup of 8 mm water equivalent thickness and also absorbs scattered radiation. Second is a 0.34 mm thick terbium-doped gadolinium oxysulfide (Gd2O2S: Tb) phosphor plate which converts incident radiation into visible light photons. Beneath, this is the array of Si detectors deposited on a 1 mm glass substrate. The aSi array is a photodiode array which senses the light photons. The light photons are converted into charge and transferred to image acquisition system for image formation. Before performing any measurements, imager calibration as well as dosimetric calibration were performed as per the Varian recommended protocol. Imager calibration is performed to improve the image quality while dosimetric calibration is performed so that EPID can be used for dosimetry purpose. In imager calibration process, first, a dark field is acquired without any radiation to correct for background radiation. Then, flood field (FF) is acquired with uniform dose over the entire imager area to correct for any pixel sensitivity variation. During the imager calibration process, the beam characteristics are washed out; hence, during dosimetric calibration, a beam profile is fed to the system to retain the dosimetric characteristics. Further, a known dose is given to the EPID to calibrate the pixel values in terms of dose. For the measurements, the active detective layer of EPID was positioned at 100 cm source to detector distance (SDD), and all the measurements were performed at dmax by placing appropriate water equivalent slab thickness in addition to intrinsic buildup of 8 mm (6 mm slab for 6 MV and 20 mm slab for 15 MV) over the EPID. 6 and 15 MV beams were delivered for jaw-collimated square field sizes ranging from 0.8 cm×0.8 cm to 10 cm×10 cm (0.8 cm×0.8 cm, 1 cm×1 cm, 1.5 cm×1.5 cm, 2 cm×2 cm, 3 cm×3 cm, 4 cm×4 cm, 5 cm×5 cm, 8 cm×8 cm, 10 cm×10 cm) for profile and output factor measurements. Only in-plane/gun-target profiles are presented in the manuscript as we observed in-plane and cross-plane profiles were matching very well. Two hundred monitor units were delivered for each measurement. The EPID 2D images were saved in DICOM image format and analyzed using in-house program. This program was developed in Matlab (version 7.0). It could extract the profiles along central area as well as central dose over a region of interest (ROI). 2×2 pixels ROI was used to extract the central dose. To calculate output factors, the central dose values were normalized with respect to 10 cm×10 cm field. For reference data, microionization chamber Exradin A16 (Standard Imaging, Middleton, WI, USA) having sensitive volume of 0.007 cc (outer diameter 3.4 mm and outer length 2.4 mm) was used for output factor measurements and stereotactic field diode (SFD; IBA Dosimetry, Schwarzenbruck, Germany), having 0.06 mm thickness and 0.6 mm diameter of active area, was used for profile measurements. This reference data were acquired using a radiation field analyzer (RFA, BP2, IBA Dosimetry, Schwarzenbruck, Germany) at a depth of dmax, and SDD was set to be 100 cm. Ionization chamber was placed perpendicular to the beam axis while SFD was placed parallel to the beam axis. While measuring small fields <2 cm×2 cm, reference detector was not used, and measurement time was increased to two-fold to decrease the instantaneous fluctuations in the measurement. For output factors, Alfonso et al. correction factors were not applied. EPID measured output factors for 6 and 15 MV photon beams were compared with corresponding output factors of microionization chamber Exradin A16, and the results are shown in [Table 1]. Similarly, [Figure 2]a and [Figure 2]b show the comparison of EPID measured output factors with the reference output factors for 6 and 15 MV photon beams, respectively. It was observed that the output factors were closely matching with the reference data for field sizes down to 2 cm×2 cm. There was a difference of +2.06% for 6 MV and +1.56% for 15 MV in output factors for field size 2 cm×2 cm, and after that (>2 cm×2 cm), the deviation was further less. Maximum deviation was observed for 0.8 cm×0.8 cm field size, and it was +16% for 6 MV and +23% for 15 MV. Output factors measured by EPID were consistently higher than corresponding reference values for small field sizes [Table 1]. When comparing the EPID measured output factors between 6 and 15 MV, the EPID performance was slightly better for 15 MV from 2 cm×2 cm to 10 cm×10 cm. 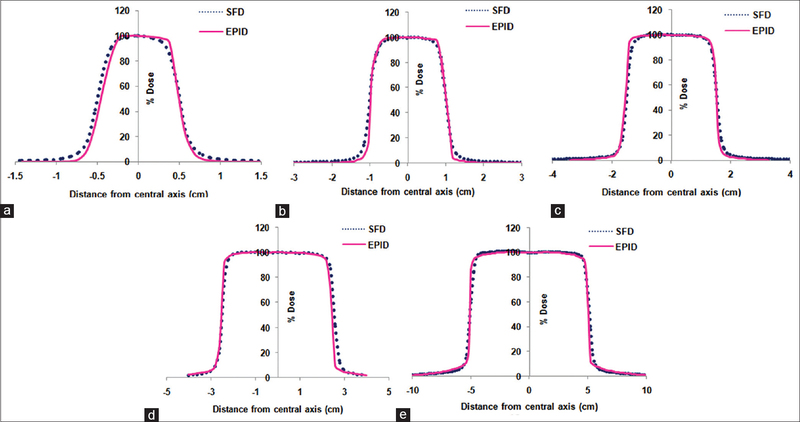 EPID measured profiles along with SFD profiles for field sizes 1 cm×1 cm, 2 cm×2 cm, 3 cm×3 cm, 5 cm×5 cm, and 10 cm×10 cm are shown in [Figure 3] for 6 MV; similarly, [Figure 4] shows the profiles for 15 MV. It is evident that profiles are matching very well for field sizes down to 2 cm×2 cm. However, penumbra and measured field size were slightly less for EPID compared to SFD for all field sizes as shown in [Table 2]. 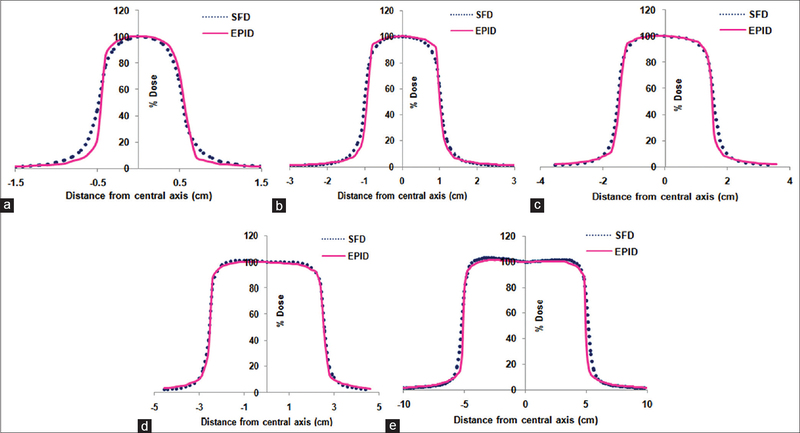 The average penumbra of EPID measured profiles was (0.20 ± 0.02) cm and that of SFD measured profiles was (0.34 ± 0.14) cm for 6 MV while the corresponding values for 15 MV were (0.21 ± 0.03) cm and (0.41 ± 0.16) cm. In this work, the performance of EPID was evaluated for output factor and profile measurements of radiation fields ranging from 0.8 cm×0.8 cm to 10 cm×10 cm for 6 and 15 MV photon beams. The advantage of using EPID for small field dosimetry is its good spatial resolution and being a 2D dosimeter, it eliminates the errors due to uncertainties in detector placement, unlike point detectors. EPID output factors were compared with Exradin A16 microionization chamber and, profiles were compared with SFD detector measurements. A16 microionization chamber measured output factors were closely matching with Stasi et al., and this ensures the accuracy of the reference data. For output factor and profile measurements, the behavior of EPID was observed to be good for field sizes down to 2 cm×2 cm and below this appropriate correction factors are required. Penumbra and field size of EPID measured profiles were always smaller than that measured by SFD. In this study, aSi 500 portal imager was used which has a resolution of 0.783 mm while aSi 1000 portal imager has a higher resolution, i.e., 0.391 mm and for that reason, the latter may provide better results for even further smaller fields. One important fact associated with EPID is backscatter radiation from its metallic support arm, which is used to attach it with linac. Several authors have reported different methods to eliminate this effect.,, Rowshanfarzad et al. reported that below 3 cm×3 cm field, there is no arm backscatter, while for large fields, substantial amount of backscatter is there which increases the radiation dose measured by the EPID. However, arm backscatter was not included in this study, and a separate study probably using Monte Carlo simulations to account for this effect may be useful for more realistic results. While acquiring a planar image with EPID, different pixels respond differently for the same dose. To correct this pixel sensitivity variation, FF correction is applied; however, in this process, beam characteristics (beam horn) are washed out and to overcome this problem, dosimetric calibration of EPID is performed. It is intuitive to know whether FF correction is really important for small fields also and for that purpose, we measured output factors without FF correction. The output factors with FF and without FF (no FF) correction for both energies are presented in [Figure 5], and it is evident that FF correction is vital for small fields also. From dosimetry point of view, commercial EPID have one flaw in their detection process, that is, they have phosphor layer and copper plate over the actual detector plate, and hence, these measurements are called indirect measurements. Vial et al. and Sabet et al. performed direct measurements with EPID and found that despite reduced sensitivity, direct measurements with EPID were more close to ion chamber measurements as compared to indirect measurements. However, direct measurements were beyond the scope of this study as removing the upper layers of EPID may damage the system. In this study, EPID was investigated for measuring output factors and profiles of small fields for 6 and 15 MV photon beams. The EPID data were slightly better for 15 MV as compared to 6 MV. Overall, it was observed that EPID is a viable option for output factor and profile measurements for small field sizes up to 2 cm×2 cm in the absence of appropriate small field detectors. The authors would like to acknowledge the Vice Chancellor, IFTM University, Moradabad for providing the support. IAEA. Report No. 398, Absorbed Dose Determination in External Beam Radiotherapy: An International Code of Practice for Dosimetry on Standards of Absorbed Dose to Water. Technical Reports Series No. 398: International Atomic Energy Agency; 2000. Sharma SD. Challenges of small photon field dosimetry are still challenging. J Med Phys 2014;39:131-2. Kron T, Lehmann J, Greer PB. Dosimetry of ionising radiation in modern radiation oncology. Phys Med Biol 2016;61:R167-205. Derreumaux S, Etard C, Huet C, Trompier F, Clairand I, Bottollier-Depois JF, et al. Lessons from recent accidents in radiation therapy in France. Radiat Prot Dosimetry 2008;131:130-5. Benedict SH, Schlesinger DJ, Goetsch SJ, Kavanagh BD. Stereotactic Radiosurgery and Stereotactic Body Radiation Therapy. CRC Press; 2014. Stasi M, Baiotto B, Barboni G, Scielzo G. The behavior of several microionization chambers in small intensity modulated radiotherapy fields. Med Phys 2004;31:2792-5. Wang LL, Beddar S. Study of the response of plastic scintillation detectors in small-field 6 MV photon beams by Monte Carlo simulations. Med Phys 2011;38:1596-9. Pappas E, Seimenis I, Angelopoulos A, Georgolopoulou P, Kamariotaki-Paparigopoulou M, Maris T, et al. Narrow stereotactic beam profile measurements using N-vinylpyrrolidone based polymer gels and magnetic resonance imaging. Phys Med Biol 2001;46:783-97. Pappas E, Petrokokkinos L, Angelopoulos A, Maris TG, Kozicki M, Dalezios I, et al. Relative output factor measurements of a 5 mm diameter radiosurgical photon beam using polymer gel dosimetry. Med Phys 2005;32:1513-20. Pappas E, Maris TG, Zacharopoulou F, Papadakis A, Manolopoulos S, Green S, et al. Small SRS photon field profile dosimetry performed using a PinPoint air ion chamber, a diamond detector, a novel silicon-diode array (DOSI), and polymer gel dosimetry. Analysis and intercomparison. Med Phys 2008;35:4640-8. Pantelis E, Antypas C, Petrokokkinos L, Karaiskos P, Papagiannis P, Kozicki M, et al. Dosimetric characterization of CyberKnife radiosurgical photon beams using polymer gels. Med Phys 2008;35:2312-20. Aaki F, Ishidoya T, Ikegami T, Moribe N, Yamashita Y. Application of a radiophotoluminescent glass plate dosimeter for small field dosimetry. Med Phys 2005;32:1548-54. Larraga-Gutierrez JM, Garcia-Hernandez D, Garcia-Garduno OA, Galvan de la Cruz OO, Ballesteros-Zebadua P, Esparza-Moreno KP. Evaluation of the Gafchromic(®) EBT2 film for the dosimetry of radiosurgical beams. Med Phys 2012;39:6111-7. Azangwe G, Grochowska P, Georg D, Izewska J, Hopfgartner J, Lechner W, et al. Detector to detector corrections: A comprehensive experimental study of detector specific correction factors for beam output measurements for small radiotherapy beams. Med Phys 2014;41:072103. Curtin-Savard AJ, Podgorsak EB. Verification of segmented beam delivery using a commercial electronic portal imaging device. Med Phys 1999;26:737-42. Pasma KL, Dirkx ML, Kroonwijk M, Visser AG, Heijmen BJ. Dosimetric verification of intensity modulated beams produced with dynamic multileaf collimation using an electronic portal imaging device. Med Phys 1999;26:2373-8. Greer PB, Popescu CC. Dosimetric properties of an amorphous silicon electronic portal imaging device for verification of dynamic intensity modulated radiation therapy. Med Phys 2003;30:1618-27. Warkentin B, Steciw S, Rathee S, Fallone BG. Dosimetric IMRT verification with a flat-panel EPID. Med Phys 2003;30:3143-55. Steciw S, Warkentin B, Rathee S, Fallone BG. Three-dimensional IMRT verification with a flat-panel EPID. Med Phys 2005;32:600-12. Nelms BE, Rasmussen KH, Tome WA. Evaluation of a fast method of EPID-based dosimetry for intensity-modulated radiation therapy. J Appl Clin Med Phys 2010;11:3185. Tan YI. 2D Transit Dosimetry Using Electronic Portal Imaging Device (Doctoral Dissertation, University of Glasgow); 2016. Dawoud SM, Weston SJ, Bond I, Ward GC, Rixham PA, Mason J, et al. Measuring linac photon beam energy through EPID image analysis of physically wedged fields. Med Phys 2014;41:021708. Sun B, Goddu SM, Yaddanapudi S, Noel C, Li H, Cai B, et al. Daily QA of linear accelerators using only EPID and OBI. Med Phys 2015;42:5584-94. Wang Y, Heaton R, Norrlinger B, Islam M. Quality assurance of electron beams using a Varian electronic portal imaging device. Phys Med Biol 2013;58:5461-75. Rowshanfarzad P, Sabet M, O'Connor DJ, Greer PB. Verification of the linac isocenter for stereotactic radiosurgery using cine-EPID imaging and arc delivery. Med Phys 2011;38:3963-70. Surendran S, Rao DP, Kunnanchath J, Cyriac SL. Dynamic MLC-QA based on portal dosimetry. Int J Eng Res Appl 2014;4:134. Moore JA, Siebers JV. Verification of the optimal backscatter for an aSi electronic portal imaging device. Phys Med Biol 2005;50:2341-50. Ko L, Kim JO, Siebers JV. Investigation of the optimal backscatter for an aSi electronic portal imaging device. Phys Med Biol 2004;49:1723-38. Rowshanfarzad P, McCurdy BM, Sabet M, Lee C, O'Connor DJ, Greer PB. Measurement and modeling of the effect of support arm backscatter on dosimetry with a varian EPID. Med Phys 2010;37:2269-78. Vial P, Greer PB, Oliver L, Baldock C. Initial evaluation of a commercial EPID modified to a novel direct-detection configuration for radiotherapy dosimetry. Med Phys 2008;35:4362-74. Sabet M, Menk FW, Greer PB. Evaluation of an a-Si EPID in direct detection configuration as a water-equivalent dosimeter for transit dosimetry. Med Phys 2010;37:1459-67.